Following on from new-found nostalgia for toys and games of their youth, collectors tempted by fond memories for often Star Wars and Lego are now moving on to vintage video games. A 1987 issue of Nintendo's The Legend of Zelda. 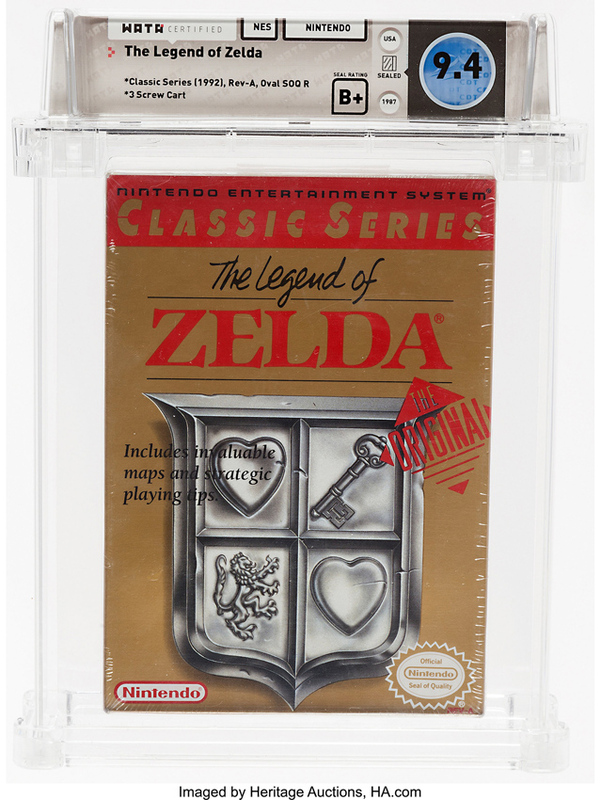 Heritage Auctions of Texas conducted its first sale of predominantly Nintendo vintage video games on January 13 – offering 25 collectable console cartridges, each graded, certified and housed in protective cases by Denver-based Wata Games. More than 30 collectors pursued a 1987 issue of The Legend of Zelda (the last release of the game on the Nintendo Entertainment System) to $2800/£2150 (plus 20% buyer’s premium). Sealed versions of this title are very difficult to find. A copy of the first game in the longstanding Dragon Quest series, Dragon Warrior (1989), brought $550 from the most eager among 17 bidders. Originally released in Japan as Dragon Quest, it was renamed for release to Western markets and offered free to new and renewing subscribers to the Nintendo Power magazine. The game inspired 10 direct sequels and multiple spin-offs. Excitebike, one of the launch titles for the Nintendo Entertainment System issued in 1985, took nearly two dozen bids before selling at $950/£730. The game was designed by Shigeru Miyamoto, creator of both the Donkey Kong and Mario series. Well-preserved versions of Super Mario Bros (1985) and Super Mario Bros 3 (1990) took $260/£200 each. The saleroom said it will offer more video game titles weekly with “some real rarities on tap for the February Signature Auction”.